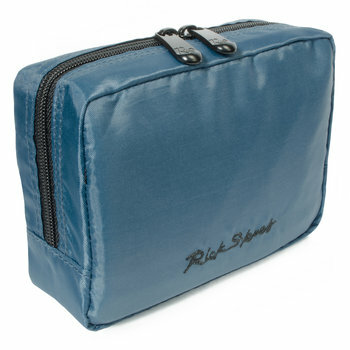 Stay Organized: Neatly tuck away all your electronic accessories in one place with our Large Go Go Gadget Pouch. Or use it for other easy-to-misplace items (like that corkscrew you're sure you packed somewhere)! Untangled and Unmangled: Stretchy mesh pockets and padded sides help tame and protect those unruly charging cords, cables, chargers, adapter plugs, batteries, SD cards, and more. 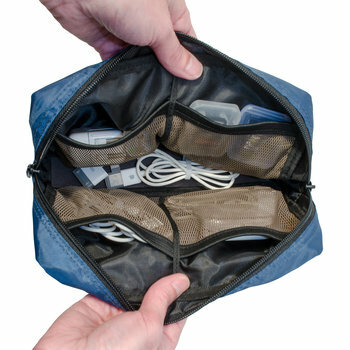 Room to Go Big: Guidebook-sized (9" x 5½" x 2¼") pouch zips open wide to reveal a 110-cubic-inch main compartment roomy enough to hold a good-size camera and/or an extended laptop cable, plus four mesh side pockets (each 4½" x 4¼"). Not Black: Blue spruce color makes it easy to locate in your luggage. Too Big? Check out our Small Gadget Pouch. Dimensions: 9" x 5 ½" x 2 ¼"